The Flexomat assembly machine is designed for low to medium volume production up to 6 million parts per year. This is ideal for prototyping, early phase development and clinical trials. 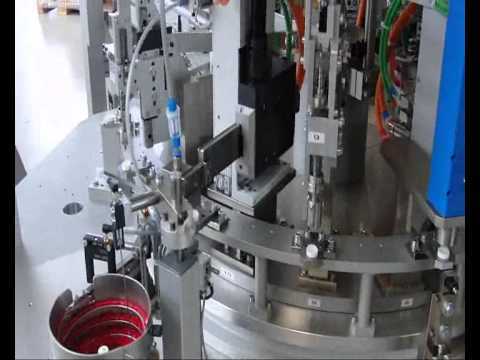 The Flexomat semi-automatic assembly machine is a single ring machine. All processes take place on the same ring. Where separate sub-assemblies are required the Flexomat can be used in conjuction with other Flexomats to make a complete assembly line. Components can be placed manually onto the feeding tracks. The machine either can be supplied with sorting bowls or this can be retrofitted at a later date. Verification of automatic processes can be done both automatically and manually. The stations of the machine are mounted inside of the machine allowing excellent access to the machine stations. Pick and place units are XY linear motor driven. This means that movements can be adjusted from the PLC and with a tool change the machine can be used to run another product. The Flexomat machine complies with GMP / Clean Room ISO 7 regulations.